Beautifully engraved certificate from the Hamersley Holdings Limited issued in 1977. This historic document was printed by the American Banknote Company and has an ornate border around it with a vignette of a factory. This item has the printed signatures of the Company’s Director and is over 24 years old. 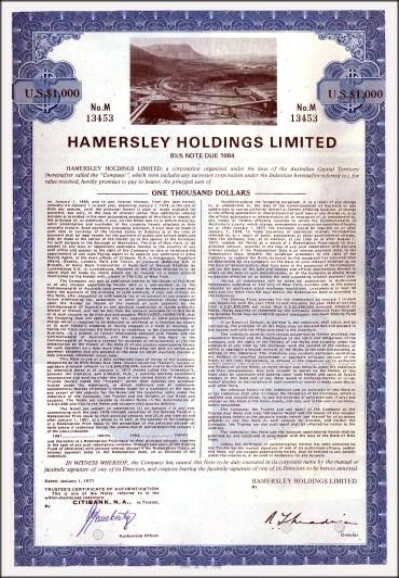 Hamersley Holdings Limited was formed in association with the Kaiser Steel Corporation of the United States, and in August 1979 has CRA acquired the Kaiser shareholding. A huge open-cut mine was established with mechanical mining and loading facilities, and a railway was constructed to Dampier, 290 kilometres northwest of Mt Tom Price, where a port and loading facilities were provided. Townships were built at the mine and at the port (and later at Paraburdoo,100 kilometres south of Mt Tom Price). This was a tremendous achievement requiring close co-ordination. The first shipments were made in 1966, and 23 million tons were produced during 1971. The mine at Paraburdoo began producing in 1973. In 1964 CRA began exploring a large low-grade copper/gold orebody on Bougainville Island, Papua New Guinea, and in the early stages Mawby was determined that exploration should be kept going. 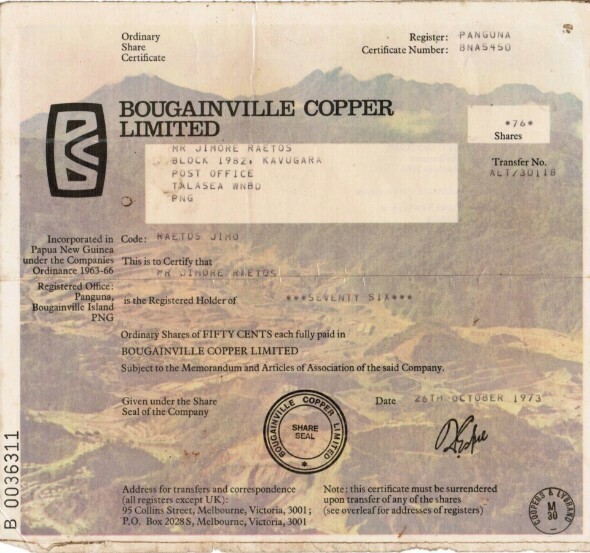 Bougainville Copper Proprietary Limited was incorporated in Papua New Guinea in 1967. Progress thereafter was fast and spectacular, and by 1972 the first concentrates were shipped. The island population has been integrated into the project, and the Government of Papua New Guinea has been substantially dependent on the royalties and dividends received. The Hamersley iron and Bougainville copper stories are so well known that it is unnecessary to deal with them at length. There were other, less publicised, projects, during Mawby's chairmanship-commissioning of new slag-fuming and electrolytic zinc plants at BHAS in Port Pirie, establishment of Dampier Salt on the northwest coast, and studies of the open-cut coal prospect at Blair Athol in Queensland. There have been substantial reorganisations and rationalizations between CRA and other companies with respect to copper smelting, coal and coke production, and zinc and lead smelting. 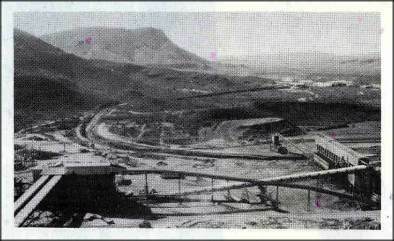 Further, in 1974 the decision was made to re-open the Mary Kathleen uranium mine. Since many years the European Shareholders have been hunting for pictures of hardcopy shares of Bouganiville Copper Limited (BCL). 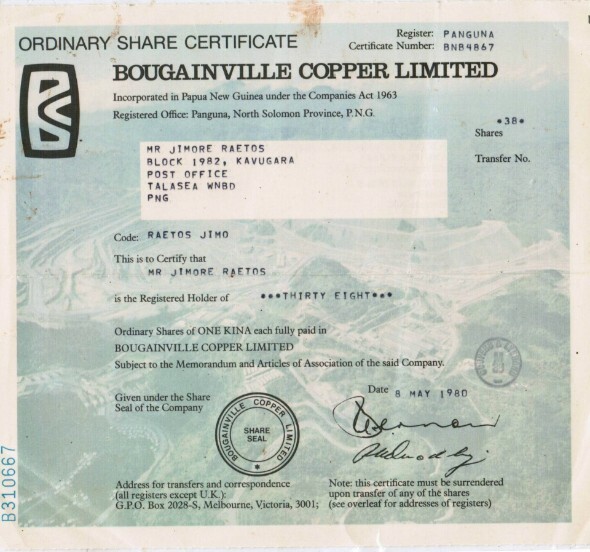 Today, an unexpected email reached the ESBC.It contained two copies of the original Bougainville Copper shares (pictured).They are supposed to value still the amount of shares indicated. Nevertheless: Since BCL decided to issue virtual shares only, these shares have to be considered as collectible items. Unfortunately BCL shares are not as attractive as some classical shares issued by big companies in the beginning 20th century. But, for people who entertain friendly relations to Bougainville, these shares might represent a special nostalgic value as a souvenir of better days. Now it's up to Bougainvilleans to make these better days come back again!